Head of the Sderot Student Council calls on the government to respond to the ongoing kite terrorism in the south. Dvir Sassi, head of the Sderot Student Council, on Thursday called for a strong response to the kite and balloon terrorism from Gaza, even at the expense of an escalation. "Obviously, an escalation is the last priority, but unfortunately, if there is a need for a military response of any kind, I stand behind it. I am not the defense minister and I do not have the political or military knowledge. I am a citizen who not only cannot sleep quietly at night, but also cannot live quietly," Sassi said in an interview on Radio Darom 101.5. He added that "our protest here is not political - people on both the right and the left are outraged and agree that it is impossible to continue this way." Sassi expressed disappointment with the political establishment and its handling of the situation in the south. "I feel that they have forgotten us, that it does not interest the Cabinet ministers enough. If there was such a wave of fires in the center of the country, there would be radio and television shows dealing with it for hours every day and all the Knesset members would deal with it as well," he said. Terrorists from Gaza have launched arson balloons and kites at Israeli territory for the last several months, burning thousands of acres of Israeli and causing extensive damage to fields, crops, and nature reserves. On Thursday, Israel’s Ambassador to the United Nations, Danny Danon, called on Deputy UN Secretary-General Amina Mohammed to condemn Hamas for its ongoing use of arson attacks that have torched Israeli land and terrorized its citizens. 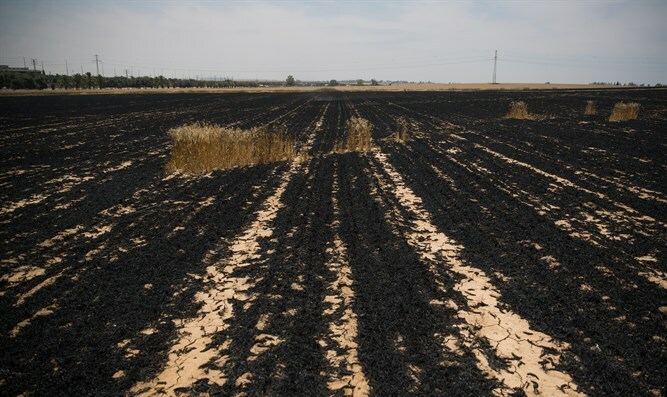 “For over one hundred days, Hamas terrorists…have used arson kites and other aerial delivery means to set almost 700 fires that have torched thousands of acres, including over 1,500 acres of agricultural fields in Israel. This is a new face of terrorism directly targets the Israeli ecosystem and has caused over $2 million in damages,” Ambassador Danon wrote in a letter to the Deputy Secretary General. “As a country that proudly spearheads the advancement of agricultural technology at the United Nations and around the world through our bi-annual resolution on Agricultural Technology for Sustainable Development, it is infuriating to see the terrorists of Hamas do the opposite. Hamas is attacking Israel’s southern source of livelihood and their acts of eco-terrorism have not only devastated land that provides food and livelihood to our civilians, but they have also caused irreparable damage to nature preserves and dozens of species of wildlife,” he continued. “In the interest of protecting the lives of civilians, their livelihood and the productivity of our ecosystem, I request that you strongly condemn Hamas and hold the terrorist organization accountable for these latest attacks,” Ambassador Danon concluded.